I combined recipes from two classic vegetarian cookbooks, Laurel’s Kitchen and American Wholefoods Cuisine, to come up with this essential cold-weather soup. It can be made very quickly if you use a food processor to chop the vegetables (excluding potato) and cook it in a pressure cooker. Combine the peas and water in a large pot and bring to a boil. While it’s heating, chop the vegetables and add them and the bay leaf, celery seed, parsley, basil, and thyme to the pot. 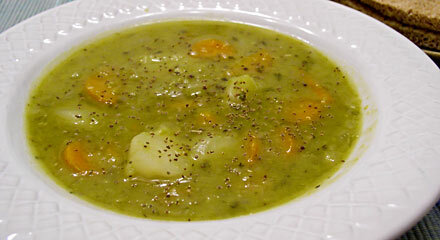 Once it is boiling, cover and cook over low heat for 1 1/2 to 2 hours and peas are very soft, disintegrating actually. Add the liquid smoke, salt, and pepper. Cook several minutes uncovered to thicken if necessary (or add water to thin if necessary). Serve with warm whole-grain bread. Pressure Cooker Instructions: Follow the general instructions but use only 6 cups of water. Cook at high pressure for 6 minutes; then allow the pressure to come down naturally. Add the liquid smoke, salt, and pepper; taste and add more seasonings as desired. Cook several minutes uncovered to thicken if necessary (or add water to thin if necessary). Makes about 8 servings, and better the next day! Thanks Susan, I appreciate the information. Happy St.Patricks Day! Hi. This tastes great. What is the nutritional exchange info on it?